3 BR Cottage -Perfect for families- Booking March-- last minute rates! 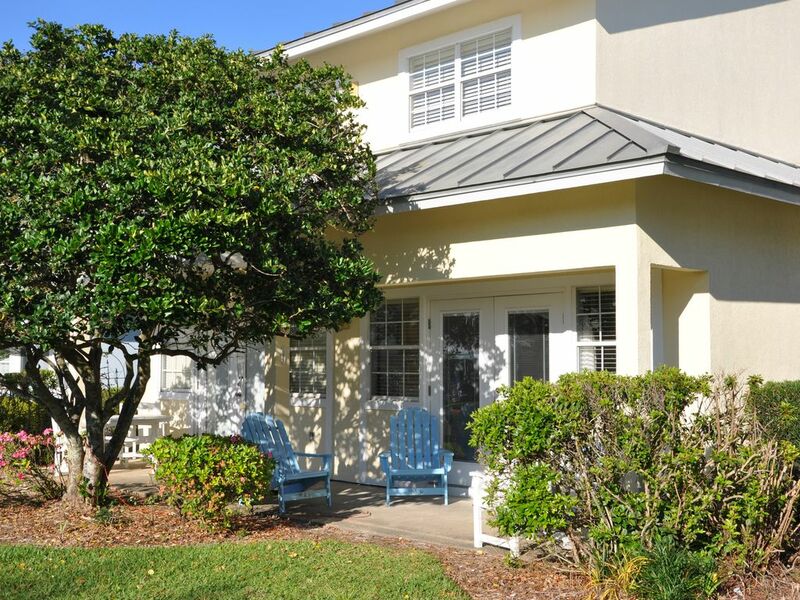 Lowest rates in Mainsail cottages! My neighbors are not happy with me because my cottage is nice and my rates are low! Wow- you would probably spend more for a single lousy room at the Ramada. Why not stay in a 3 BR cottage for my 'I hate vacancy' rate? HERE'S THE DEAL....anytime after Labor Day and before Jan 1, with a minimum stay of 3 nights, the rate is $129/night plus cleaning and tax. For a long term visit of 30 days or more, CALL ME AND LET'S MAKE A DEAL! We have a great snowbird community that will make you feel very welcome. Try it one year and you'll want to make it an annual event! Very short walk to beach and a heated pool out the back door. Silver Sands outlets right across the street. If it feels like a home, that's because it is. 1700 square feet of living space can comfortably sleep 11. TV, VCRs and DVD players both upstairs and downstairs keep the kids occupied while mom and dad dress for a night out at one of the area's fine restaurants. Need to hold costs down? Full kitchen and BBQ grills allow you to eat in. Care for a view? Private balcony off upstairs bedroom allows for scenic overlook. We are in a quiet, gated community so you need to make no effort to avoid noise and crowds. We came to Destin on vacation for the first time in 1997 and loved it so much, we eventually bought this 2nd home. We need the rental income and have tried to make our cottage as enticing as can be so you will want to come back time and time again. Total beach lover who lives 3 hours from Ocean City, MD and drives 17 hours to Destin because it is the best beach experience EVER. Been renting since 2004 and love to help families have the perfect vacation. I've created my own personalized guide to area and will happily share this info with my guests. I also hate having vacant nights at the beach, so contact me and let's get you to the beach. Because it is great. 2 pools, a very short and SAFE walk to the beach...all through the resort with no streets or parking lots to cross. There is green space for kids to play, grills for guest use, basketball, shuffleboard, a game room, fitness center... Near great restaurants, shopping, and all kinds of fun things to do like The Track, Big Kahuna's, Destin Harbor, Destin Commons, and much much more. Enjoy a house...a stand alone house with a backyard, a nice back patio to enjoy...plenty of space all the way around, inside and out. Why settle for a cookie cutter condo 6 floors up with a little slab of concrete hanging on the side of the building if you want some outside relaxation while others are still sleeping or getting ready to go out. The cottage is located almost right next to the heater pool. The walk to the beach was about three football fields which if you decided you needed something back at the cottage you really wanted it. The tennis area and other pool and hot tub area was well maintained. The basketball court was more of an afterthought and there were no lines so it’s more of a basketball goal than a court. But hey who goes to the beach to play basketball? The beach is just perfect. The house has a good floor plan but be mindful that the additional bedroom is attached to the bedroom with the queen bed. The master bathroom is sublime. You will have a fun time figuring out which light switch goes with which light. The kitchen had almost everything you would need but bring your own kitchen. knife as all the knifes are dull. Phil was good to work with and very attentive. There is construction going at the intersection near the entrance so it may take a minute or two longer to exit into the main road and the light only lets maybe six cars through. Overall a great place for families both young and old. The home was very nice. There were 11 of us and there was plenty of room. One of the pools was just out our back door. The beach was a bit farther than I liked, but it wasn’t bad at all. The community was very nice and secure. Very enjoyable! The only negative was the traffic. Only a short walk to a beautiful beach. Our family came to celebrate our daughter's graduation from college. Visiting family could not believe how perfect the accommodations were for this event. We had plenty of room for everyone. We also enjoyed the many amenities offered at Mainsail. The overall feeling was peaceful and family members came and went to the beach as desired. Others relaxed on the back patio with coffee and shared stories with younger generations. We had almost everything we needed at our fingertips. Winn Dixie was only a couple blocks away and Silver Sands Outlet Mall was just across the main thoroughfare. We were close to many other conveniences as well. Mainsail is gated and the security provided added to our feelings of serenity. Although we were not on the beachfront, the walk was reasonable and we had the heated pool and grills available just out the back door. The property also allowed plenty of room for parking which we definitely needed as family arrived and departed at various times throughout the week. I could not give five stars due to the fact that when the maintenance company was contacted about some needed repairs they promised to come and never did. The blue sleeper sofa in the smallest room was broken and we were fortunate that we had a spare air mattress to use or we would have been short on "beds". Overall, we had a very pleasant experience and would love to stay here again sometime. Thank you for the review. One additional comment regarding the management company. When the guest concerns were passed along to the mgt company by the owner earlier today, the mgt company stated that they had a pleasant conversation with the guest and were told that none of the concerns were urgent and that they need not come right over. Based on those comments, so as to not disrupt the guests, the management company had scheduled the repairs (battery replacement in clock and mechanism on sleep sofa) for today. To say that they failed to respond in a timely fashion is a bit of a misrepresentation of the facts. Amazing!! This place is well worth the money. It's just steps from the ocean and has a heated pool out the back door. The cottage is always meticulous when we arrive. It's a family friendly area, very peaceful and relaxing location to get away. This was our 7th stay and we always look forward to next year. Phil makes the booking process seemless. He ensures that from reservation to check in and check out, the customer is well informed and at ease. I'm always happy to hear kind compliments.